This What Is It Wednesday may be easy for some of you. I actually grew up eating these. My parents grew them in our garden and we ate them almost every summer when I was a kid. My husband though had never eaten these. He thought that they looked a bit strange when he saw them sitting on the counter. He had no clue what they were. Kohlrabi….they also grow purple ones also. Delicious raw…taste somewhat like a cross between a turnip and a radish, imo. Definitely kohlrabi. And it sounds really good right about now! It’s funny. 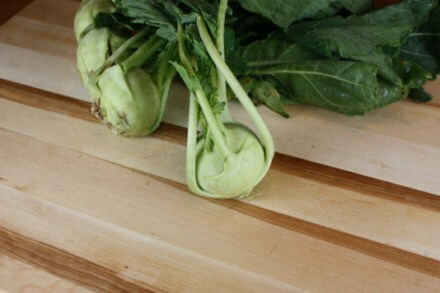 I knew what it was when I saw it – kohlrabi – and double checked myself. 🙂 But I have no idea how to cook them or what they taste like. I look forward to your cooking post on them. I love, love, love kohlrabi!!! Wish it was a little less expensive, but still love to eat it raw with a little bit of salt! Don’t know if you can cook them or not – always eat them raw! Yes, you can cook them almost any way you cook a potato, after you cut off the stems and peel them they are very good fried. a distinctive taste and we like them. Definitely kohlrabi! My grandparents were from Czechoslovakia and grandma used them in a lot of her soups. When I was visiting there, I noticed they also use them in soups (like chicken soup), but also you can peel them and eat them raw….no salt needed! They are normally sweet. Glad you found them at Whole Foods. It’s kohlrabi. I love these. I eat them raw alone or with vegetable dip or cook them. They are delicious. I made them for my fiance who likes everything but had never tried them before. He loves them now. I get them at the farmers market every year. I can’t get enough of them. yep – kohlrabi 🙂 A dear friend introduced us to them about 7-8 years ago. We just peeled and cubed them, boiled them and either left them cubed or mashed them. They remind me of St Patrick’s Day dinner. When boiling the corned beef, cabbage and potatoes all together, the potato and cabbage flavors blend…and that is what this tastes like to me YUMMY:) and they are good raw too, although I prefer them cooked. Kohlrabi!! I love it!! Think I am going to have to go get some seeds and plant them this weekend. Then I will be able to have them in a few months. Can’t wait!!! I concur, kohlrabi, though I’ve never tasted it. We bought one at a farmer’s market this last summer, but I didn’t know what to do with it, so it spoiled before I could figure it out and get up the courage to foist it on my family. I grew up eating Kohlrabi as a child. From what I remember, my mom said it is in the same family as broccoli. When the outer fibers are completely removed from the bulb looking portion of the vegetable. When the inner part of the bulb is cooked, it even tastes kind of like the stem of broccoli with it’s fibers removed. So, I prefer Kohlrabi in small thin slices, stir-fried with beef….reminds me of stir-fried Chinese broccoli and beef…only without the florets (i.e. flower buds). Lynn, Thanks for your post! I think of childhood often.